Now you can have all your Bibles and Bible study reference materials available to you wherever you go. Whether its a single favorite version or a complete Bible reference library, with Olive Tree Bible Software you can have it installed on your handheld computer for quick reference or serious study. The New American Standard Version (NASB) is considered one of the most literal translation of the Bible in the English language, consistently following the oldest and best manuscripts. Millions of people, students, scholars, pastors, and missionaries alike, have trusted the NASB, learning from it and applying it to the challenges of their daily lives. 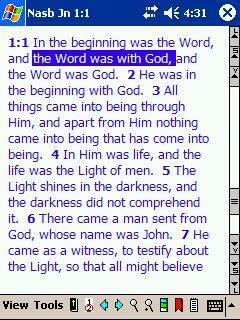 The NASB provides a precise translation with which to conduct a personal journey through the Word of God. The updated version continues this commitment to accuracy, while increasing clarity and readability. Vocabulary, grammar, and sentence structure have been carefully updated for greater understanding and smoother reading. To install: Download and run the exe file. 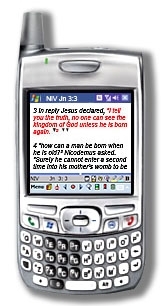 Follow the instructions to install BibleReader and the NASB to your Pocket PC. If you have a Macintosh or need to manually install, please visit http://www.olivetree.com/help for information on manual installation. Many Bibles and other material are available for purchase and free here at Handango or from olivetree.com.